The Just-Right Pillow – He Said What?! One of the main characteristics of Asperger’s Syndrome, or any other form of autism, is the insistence on sameness that displays itself in a multitude of ways. Aaron manifests this characteristic in so many areas every day of his life. One way in particular is his bed, as I’ve written about in other blogs. Every tiny aspect of his covers, his pillow, his nightstand, and even the items that he insists on putting on the floor around his bed must be just so-so. If they are out of place then Aaron cannot rest. I remember when he still put his stuffed animals on his bed. He did this into his early 20’s, which bothered me a lot. I tried to get Aaron to put the animals away but he wouldn’t hear of it. Every night he would meticulously place each animal on the bed in just a certain order, each in their own place that never varied. Then he would adjust each arm, each paw, each ear, each tail…………and step back to view his bed. If anything was out of place he would then adjust it carefully. Or if we messed anything up as we said goodnight, it had to be fixed immediately. Only when it was all exactly right would he softly climb into bed and settle down for sleep. When Aaron had his VNS surgery, his upper chest and neck were very sore from the incisions. Only then did he agree to let the animals stay in their crate in his closet. Lo and behold, he realized that he could sleep just fine without his stuffed animals! And also saw that he had more room to toss and turn without the fear of messing up a tail or an ear on his stuffed companions! He has never asked for them again. Victory!! One day years ago I bought Aaron a body pillow to use. I thought that it would keep him from settling at night into the space between his two regular sized pillows, where I would often find him during a seizure or when getting him up in the mornings. Sure enough, he slept very well on his new large pillow and has never wanted to go back to regular pillows again. There are some requirements for his body pillow, however, when we help him make his bed or change his sheets. The pillow must be stuffed smoothly and fully into the very long pillow case, with no wrinkles or bulging. And when placed on his bed, the zipper must always go on the left side of his bed. Always. This morning Aaron was grouchy, not wanting to go to Paradigm. I just treaded lightly as I poured his coffee and offered him some breakfast, which he refused. I went about my business as usual, hoping all the while that he would settle down and cooperate. I still kept up my soft tone while being firm, not giving in to his demands to stay home. And for some reason, he did start calming down. I was in my bathroom getting ready when I heard him walk into my room and say, “Mom, something’s wrong with my pillow.” I glanced out into my bedroom to see that Aaron had placed his long pillow on the end of our bed. “What’s wrong with it, Aaron?” I asked. He pointed to it and said, “See? It’s all fluffed up!” I couldn’t see anything fluffed up about it, but I knew that in his current mood I needed to take his concern seriously. Any dismissive attitude on my part pertaining to his pillow would possibly only escalate his fragile mood. 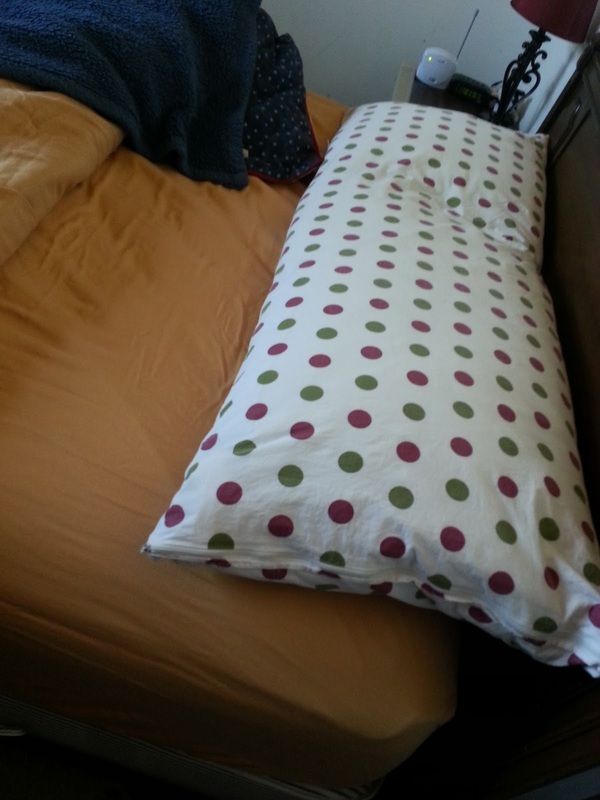 I peered down at the seemingly normal pillow as he pointed out the problem. And yes, there it was………..clear to me, since I do tend to see the world through Aaron’s eyes. The pillowcase had been changed the day before, and the end of the pillow that Aaron sleeps on………the unzippered end……….was not perfectly flush inside the pillowcase. The two sides at the end of the pillow were a little folded in, which made the two corners of the pillowcase sag down a little. So this was why, when I went in to get Aaron up this morning, he had pulled the pillow way over so that he was sleeping in the middle of the pillow and that unzippered end was hanging off the bed. He could not bring himself to sleep on that part of the pillow that wasn’t just right. And he confirmed this as he said, “I had a hard time sleeping on my pillow, Mom. It wasn’t right! It was all fluffed up!” Yes, it was a little poochy there……..fluffed up, as Aaron says……….so I pulled the pillowcase back until it was nearly off and I made sure the corners of the pillow were rearranged so that they fit into the corners of the pillowcase. Aaron watched carefully. I laid it back on our bed as he examined it……….and was very relieved when he gave me his word of approval. We put the pillow back on his bed then, making sure the zippered end was on the left side of the bed, of course. He had already asked me if I would help him make his bed while he was gone……….which is really asking me to just make his bed while he’s gone, which I’ve told him over and over. Anyway, we got every cover just right and all the wrinkles tugged out and things tucked in that must be tucked in……….and Aaron was happy. It was such a small thing, that fluffed up pillow. It would have been easy for me to dismiss it in my hurry to get ready. But that small thing to me was no small thing to Aaron, and it was best for me to recognize that and deal with it in an understanding way at that moment. It saved a lot of anger in the long run, that’s for sure. For Aaron would have been angered and bothered all day over that fluffed up pillow, and at my lack of comprehension about its importance. This is a lesson that is reinforced almost daily in our home…………that small matters can be huge to Aaron, and to save huge outbursts or distress on his part, it’s best to nip it in the bud. Repairing the fluffed up pillow was no big deal, seemingly, but it sure was to Aaron. He saw my interest, too, and I hope he saw my love for him. He went happily to his group, chattering all the way. That makes for a good day for both of us! And I’m sure that we’ll both sleep better tonight. Previous Previous post: SHE’S CRAZY!!! !